Don Miguel Ruiz is the author of the best-selling (1997) book, The Four Agreements. My description of the book is: letting go of unhealthy behaviors that result in suffering and making healthy choices that are aligned with what makes you truly happy in life. Ruiz suggests that a person can make four agreements in order to be happier. Being impeccable with your word is the first those four agreements. Avoid speaking harm or ill will about yourself or others. People want to do the best they can in life at any given moment with the skills they have. If they could do better then they would be be doing it already. People can definitely improve and get better in all areas of life. I avoid personal disclosure when conducting therapy sessions. I will disclose when I think it is in the benefit of the patient. Today, I’m revealing a very personal disclosure to the readers at Rec Therapy Today because I believe my personal example will illustrate the importance of this skill. My problem: I didn’t have good interpersonal skills as a teenager. My skills were often quiet ineffective. I did the exact opposite of being impeccable with my word (way back in the day, the late 90s) when I was a teenager. The truth is: I absolutely adored and loved a girl back then who I’ll call Felicia. And do you want to know the good news? She liked me too. She’d write me little letters and stop by at my work. She even went to prom with me. I didn’t speak the truth. I thought I wasn’t good enough to be with her, which I now know is a lie. I’m definitely a worthwhile person. I talked to her in a rude, sarcastic tone of voice, which I regret now. I hate I acted that way. At one point, I was feeling jealous and angry (over nothing in particular). I told her the worst thing I could have done. I told her: I hate you. Don’t talk to me ever again. Go away. Leave me alone. What the hell was I thinking? None of that was true. It was the exact opposite of what I truly felt, thought, and wanted. It gets worse: I made the dumb choice to date one of her best friends. I didn’t really love her best friend. I only dated her friend to make to make her feel jealous. The girl who I loved would try to talk to me in public places from time to time, like the mall or the local coffee shop. I’d turn my head. I wouldn’t respond to her. (yeah — I acted in a mean spirited way, that I feel embarrassed about that now). I can still hear the hurt the sound of her voice when she asked, “why not talk to me?” I turned my head and walked away. I definitely had interpersonal problems. It’s no wonder I didn’t end up with her. I wasn’t impeccable with my word. I was the exact opposite of that. I’ve grown, matured, changed, and learned over the years. I’m wiser now as I’m approaching 40-years in age (in a year and a few months). I’m sure she has grown too. I read in the newspaper that she was getting married (many years ago). and I authentically hope she and her husband and family are doing well these days. I forgive myself for the way I behaved towards her back in the mid-90s because I was doing the best I could with the limited amount of skills I had at the time. If I had better skills in the 90s, then I would have done better. I would have communicated honestly. I would have said what I meant. I would have been nice, kind, and respectful. I would have told her that I love you no matter what and that I’d be here for you no matter what. Some lessons people just have to learn on their own. 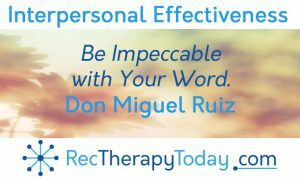 And as Don Miguel Ruiz suggests, Be impeccable with your word.